Adding a tale of joy to this private Malibu, California estate that had been purchased by Princess Diana and Dodi Fayed just months before their untimely deaths, this romantic wedding included this emotional mother-son dance among its beautiful moments. I love the combination of tears and happiness on her face and the way he smiles down at her. Malibu’s Villa Sancti Di Bella Vista wedding photography included incredible views of the ocean framed by stunning cypress trees on two acres of stunning landscape and a little bit of Tuscany in California. The villa features seven fountains, pink rose gardens and copious natural beauty everywhere, just a few of the reasons it is known as one of Malibu’s most prestigious wedding venues – and the perfect place for memorable Malibu wedding photography. This photo showcases some of the manicured greenery and the beauty of the sky as the sun began to set that night. Earlier in the day, the men got ready in the villa’s fabulous study while the women prepared for the day in the giant master suite, with everyone enjoying amazing ambience along the way. After the gorgeous outdoor wedding ceremony, a fabulous outdoor reception featured long tables and an incredible sunset over the ocean as well as dancing the night away on the terra cotta patio with magic California light kissing everything and everyone in sight. 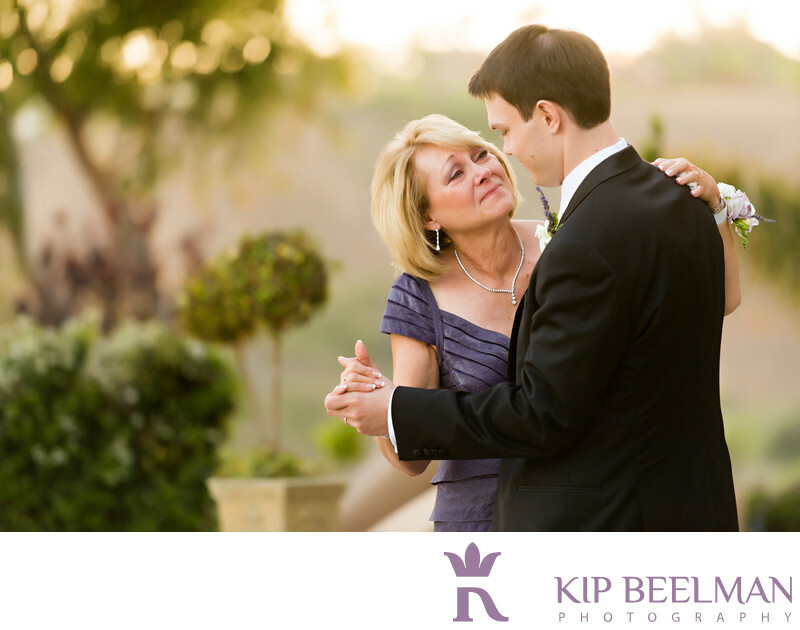 As mother and son clasped hands and shared a dance together, there were tears and smiles and magic swirling in the warm air. Location: 6380 Delaplane Rd, Malibu, CA 90265. Keywords: Estate wedding (24), Malibu (3), Outdoor Wedding (72), Villa Sancti di Bella Vista (3).